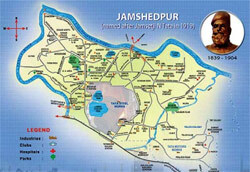 Jamshedpur has one of the highest green cover (more than 37.2%) of all cities in India with over 45 big and small community parks covering an area of more than 400 acres with the largest Jubilee Park measuring about 230 acres. Jamshedpur is also blessed with a huge Dimna Reservoir with a capacity of 35000 ML - rain water harvesting initiative way back in 1920s. JUSCO has a 24x7 customer complaint command centre (JUSCO Sahyog Kendra) for civic amenities and municipal services - a unique and one of its kinds in the country. The standard and quality of potable water, sewage treatment facility, power distribution and MSW management at Jamshedpur is considered to be a benchmark in the country. 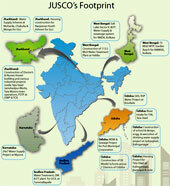 Use of LoRaLPWAN technology for data transfer. Integrated Command and Control Center (ICCC) with Dashboard for city-wide data analytics & control. Water Management: Sewage Network Management (Manhole), Water Tower Automation, Water Quality Testing. Power Services: Sub-Station Transformer Monitoring, Street Light Monitoring. JUSCO Sahyog Kendra (JSK): Digitalization of Joint Measurement Records (JMR) and JSK Job cards. Others: Workforce Tracking (Vendor Workforce), Smart Parking, Surveillance, Vehicle Tracking.